In Pictures: "An Album of Railway Engines"
Between our more detailed pieces it is nice, occasionally, to draw breath. Beginning in 1875 cigarette cards became a popular collectable in both the UK and abroad. They often featured illustrations of various modes of transport, with locomotives particularly popular. Occasionally albums of such cigarette cards can still be found in second hand shops and markets, and one such album recently crossed our desks here at LR Towers. 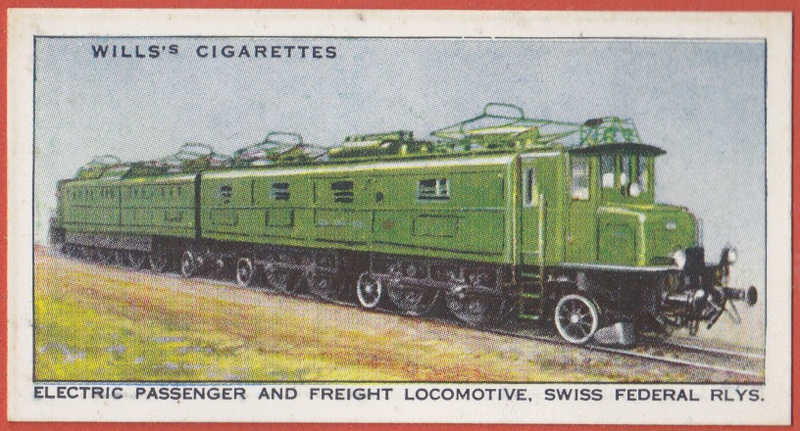 Its contents were in good condition and we share a selection of its cards, and the album’s descriptions of the locomotives they feature, here with you. Sadly the album is undated, but we have full faith in our commentariat to help us pin down a likely print date. The interest of this 4-6-0 three-cylinder express passenger engine, completed in May 1935, centres in the the beautiful finish. The shiny black of the boiler, cab and tender sides is contrasted with the chromium plating adopted for wheels and motion work, steam pipe casings, etc. No. 5552 bears the name “Silver Jubilee” in honour of His late Majesty King George V’s Silver Jubilee. She was exhibited at Euston, together with the former L.N.W.R 4-4-0 engine “Coronation” (built 1911) during Silver Jubilee Week May, 1935. On Nov. 6th 1935, she worked the honeymoon special conveying the Duke and Duchess of Gloucester from St Pancras to Kettering. The familiar exhaust beat of the orthodox steam locomotive is strangely absent when this engine is running, for the drive is by turbine and gearing instead of by cylinders and pistons. The smooth turning effort imparted to the driving wheels by a turbine and the very gentle exhaust, thus saving fuel, have long attracted locomotive engineers. Our illustration shows No. 6202, a 4-6-2, which was introduced in 1935, the first of the type to be built by a railway company in Great Britain. The main turbine, used for forward running, develops 2,000 h.p. and is carried under the casing near the front; a smaller turbine for backward running is on the opposite side. A great deal of interest was aroused in railway circles when it became known that an electric battery had been invented which could be recharged much more quickly than the usual type. 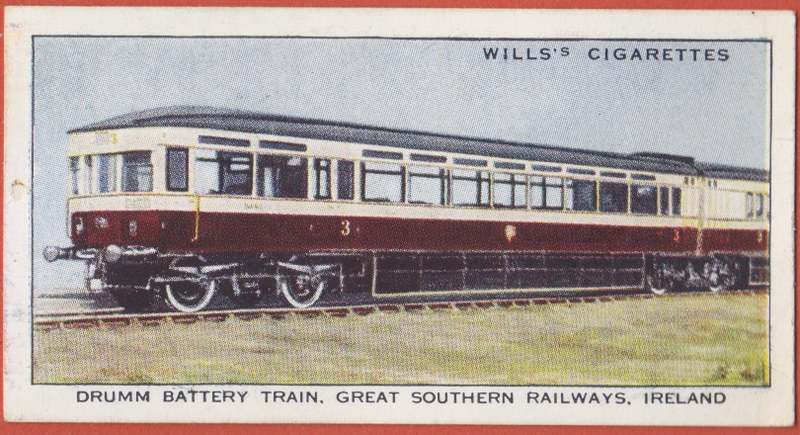 The Great Southern Railways of Ireland installed these batteries (constructed under the patents of the inventor, Dr. J. J. Drumm) in two two-car units, each equipped with electric motors on the middle bogie and working on the same principle as an electric train, but without requiring side rail or overhead line current transmission along the track. These trains work between Dublin (Amiens Street) and Bray, one set performing a total of 1,000 miles a week. In order to recapture long-distance traffic from road and air transport, and to effect more economical operation, the railways of the U.S.A. are acquiring streamlined Diesel trains. 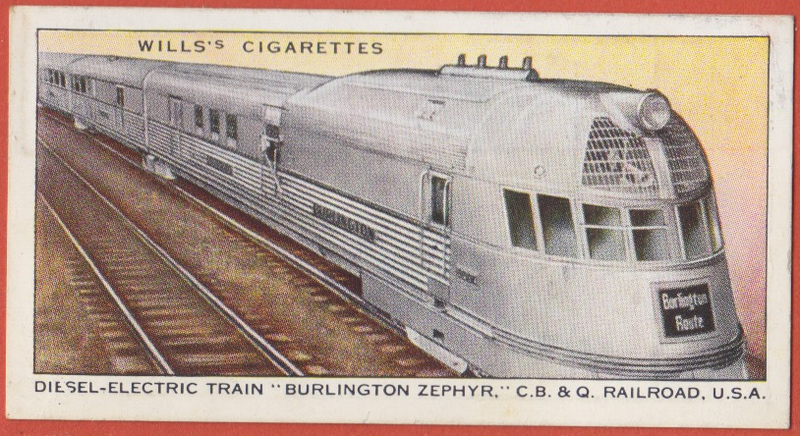 Examples are the stainless steel “Zephyrs” on the Chicago, Burlington and Quincy Railroad, two of which work a double trip per day each between Chicago and St. Paul, a round distance of 862 miles. Other Diesel trains are at work in the U.S.A., Germany, Italy, France, Denmark, Belgium and Holland. A top speed of 120 m.p.h. is credited to a Diesel train, and in Germany they regularly run at 100-104 m.p.h. For its principal heavy expresses, the L.N.E.R. uses a 4-6-2 or “Pacific” type three-cylinder engine. The latest weigh, with corridor tender, 158 tons 13 cwt., and the majority bear names of racehorses. No. 2750, “Papyrus,” became world-famous on March 5th 1935, when, after having already run 392,852 miles since being built in 1928, she attained a then world record maximum speed for steam of 108 m.p.h. With her load of 216 3/4 tons, “Papyrus” ran from Kings Cross to Newcastle and back (536.6 miles) in a total running time of 7hrs, 48 mins, 55 secs., and for 300 miles averaged 80 m.p.h. 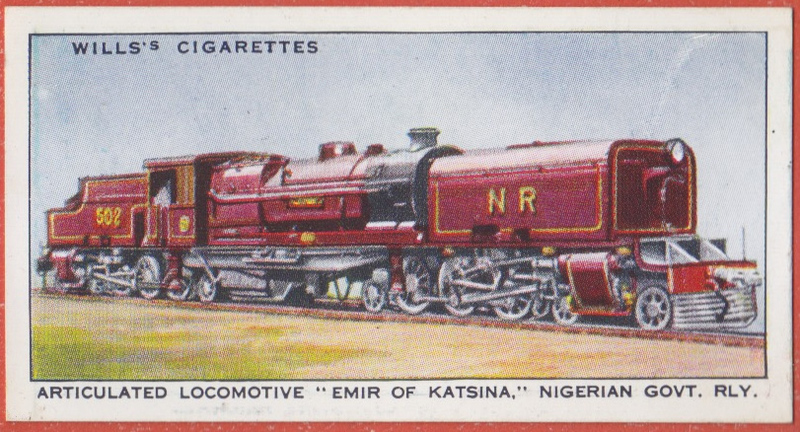 These Beyer-Garratt 4-6-2 + 2-6-4 articulated locomotives, which bear the names of Nigerian chiefs, have their weight of 111 1/2 tons spread over twelve axles because of the very light rails and bridges on certain sections over which they have to run. They are handled entirely by African natives, and during the six months heavy export season are used on the Jebba-Minna section. For the rest of the year they are employed on through runs with passenger trains between the port of Lagos and Kano, a distance of 700 miles. Each engine was shipped in three parts from the builders in England. Locomotives of the same power and of a similar weight, but designed with fewer axles than this 4-14-4 locomotive, are in use in the U.S.A. But those responsible for this enormous engine found that to get the power required and the necessary flexibility, and without strengthening the existing road, the weight of the engine would have to be distributed over no fewer than eleven axles. This engine, which was built for heavy coal traffic in the Donetz Basin, runs on the 5 ft gauge, is just under 110 ft. 9 in. long with tender and, in working order, weighs (with tender), 327 1/2 tons. It is required to move 2,500-ton loads over heavy grades. For working moderately-heavy trains on which the larger six-coupled express engines are not required, or the use of which is deemed unsuitable by weight or other restrictions, the Southern Railway has a class of three-cylinder, four-coupled bogie engines, named after public schools. The most powerful 4-4-0 type engines in Europe, they are employed on express services on the London-Hastings and London-Portsmouth routes, and elsewhere. They haul loads of ten and eleven coaches, weighing, with passengers, little short of 400 tons in all, at high speeds over hilly roads, and have shown themselves capable of fast work. Electric Passenger & Freight Loco. This 7,500 h.p. 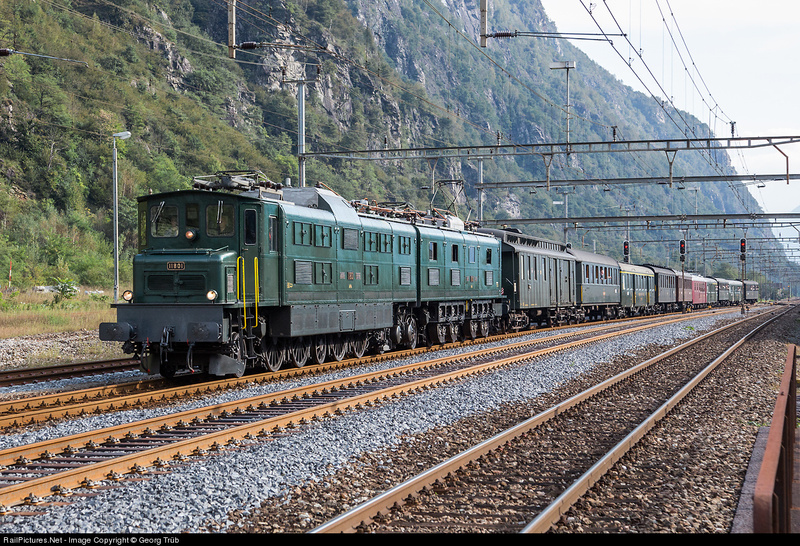 single-phase electric locomotive employed on the St Gotthard line of the Swiss Federal Railways, is the most powerful electric locomotive in Europe. Although running as one unit in service, it really consists of two identical halves, each having its own driving compartment. One of these double locomotives is sufficient for the heaviest express passenger trains, in place of two of the previous type employed. It can haul a 600-ton passenger train at 38 m.p.h. up a 1 in 37 gradient, and a 750-ton goods train at 30 m.p.h. the maximum speed of the locomotive being fixed at 62 m.p.h. And if you can have an operational “battery train” back when whenever this album was from, how hard can it be to convert all our buses to battery-electric? ? Lovely article. I’m reminded of the Monty Python link line……..”and now for something completely different”! Looks like the Railway Engines set of 50 from 1936 as Manorbier Castle was not streamlined at Swindon until Spring 1935. 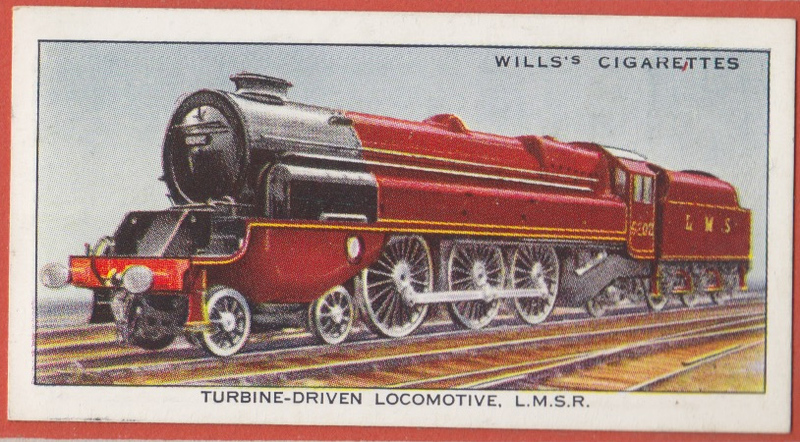 Wills produced a set in 1924 called Railway Engines and a set called Railway Locomotives in 1930 and another Railway Engines in 1936 – an adhesive set. A picture of the reverse of one would give the title but of course if they are stuck in that is impossible to provide! Sorry! Should have read the text better as the first card clearly talks of 1935. 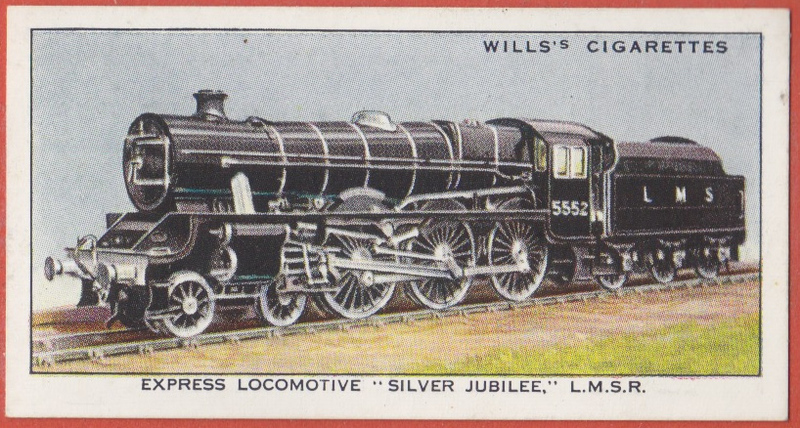 Wills did not produce another railway themed set after 1936. The reference to “His Late Majesty George V” puts the date of publication to no earlier than January 20th 1936. 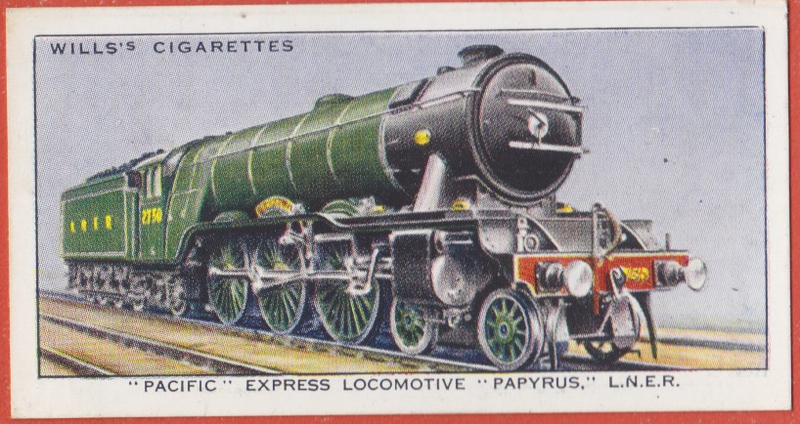 Although we haven’t seen all the cards in the set, the attention given to “Papyrus”‘s 108mph record suggests that Mallard’s exploits in 1938 were still to come. No mention of the LMS streamliners of 1937 either. Coincidentally I have the full set on a framed display board – they are entitled ‘W.D. & H.O. Wills 1936 Railway Engines” They do add to the railway theme of my office at home. and also by utilising third rail or overhead collection “extending say from anything between half a mile and three miles either side of a station.. and with gaps of between 10 and 30 miles between charging sections.. but with power sections e.g. on inclines to assist the batteries”. There’s a sad connection here with one of this site’s best articles – the LMS turbine locomotive, having been rebuilt into a conventional loco, was involved in the 1952 Harrow rail crash. Re: “Papyrus”: I would be enormously grateful if we could possibly maintain the distinction between “principal” (main, chief, leading) and “principle” (theory, belief, …) . I hope that the noble lord, Lord Dawlish, and my honourable friends the members for Purley and Walthamstow will speak up in support of my observation. What a great record of the “state of the art” about 80 years ago. Are sites like this the cigarette cards of the future? @Graham Feakins: An independently powered EMU which could use discontinuous electrification? The cutting edge of technology doesn’t change much, does it? Old Buccaneer 03.36: Anyone who has read David Wardale’s extraordinary work “The Red Devil and Other Tales from the Age of Steam” may well conclude that the state of the art for steam locomotion wasn’t up to much, even by the mid-30s. There was a card in this series that showed the first-livery version of the A-4’s (IIRC), since they are referring to Geo V’s death & “the Silver Jubilee”, by definition was in service in 1935 …..
One of the reasons I included it. I did wonder if anyone would spot the connection! @OldBuccaneer – I entirely agree about the wince-making confusion of and principle and principal but I had stayed my hand as I suspect I already have a reputation as a tiresome stickler for literacy. [Some of the posts on other threads really beggar belief for their sheer incomprehensibility – and yet stil lthey post…]. @MikeP -that reference to native crews struck me,too – not something you’d get away with now, although it may just be relevant that if Nigerian railways provided a full crew from native Nigerians, they were being quite progressive by the standards of the day. South African Railways restricted black footplatemen to firing duties only. Graham H: Thank you for staying your hand. The article has been corrected. I had assumed the text was a faithful transcription of the original caption, rather than an error introduced by JB. The reference to a “then” world speed record for steam suggests that the record had already been broken when the cards went to press. “Silver Link” achieved 112 mph in September 1935. Both the steam turbine and Drumm battery seem on the face of it to be technologies that either had at the time, or even still have potential broad applications, and advantages over other conventional technologies. I wonder what was wrong with them that they didn’t get taken up more broadly. I have a similar set of cards from about the same era showing a “selection of railway infrastrucutre” (signals, buffers, water towers etc). Let me know if you want some scans for a follow up article! 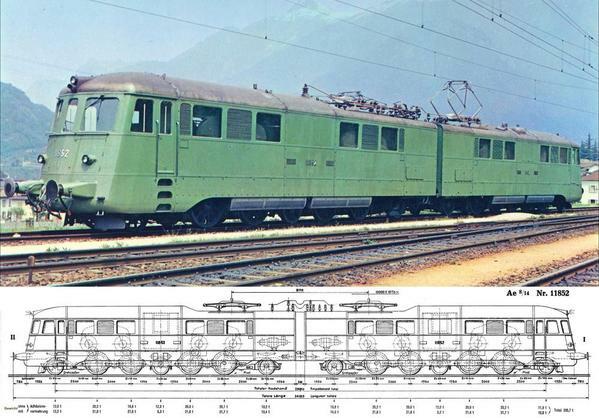 The SBB Ae8/14 11801 had, by 1935, been followed a more streamlined version – 11851 (built 1932) – and it’s slightly surprising that it isn’t that one that’s depicted. The Soviet 4-14-4 seems to be the passenger version (AA20-1) of a pair that was built in 1934-5; if so, it’s the only picture I have been able to track down – the freight version (AA20-0) had a smoother boiler casing apparently and was demonstrated to the public in January 1935 without entering service. In the circs, one wonders where Wills found their illustration. What remains of the Wills Building at Newcastle is the office block, converted into luxury flats, facing onto the New Coast Road. The factory itself, the other three sides of a quadrangle, were knocked down after the factory closed because the nicotine impregnated in the walls made it unsuitable for any other use. 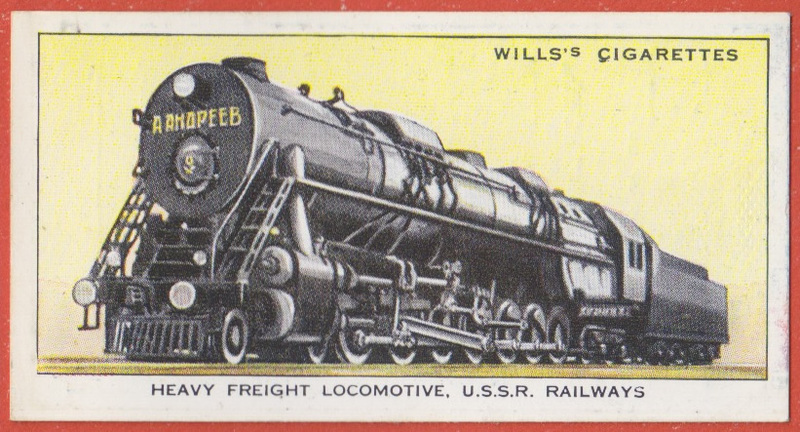 Interestingly, WD & HO Wills (as part of Imperial Tobacco) continued their love of railways on collectors cards. Wills’ Castella Cigars (anyone remember “The cigar for the price of a pint.”?!) carried collectors cards in the 1990s. Between 1991 and 1998 a series of eight sets was produced. 1992’s set was “In search of steam”, 30 cards with and international railway theme and an accompanying pictorial album to place them in. 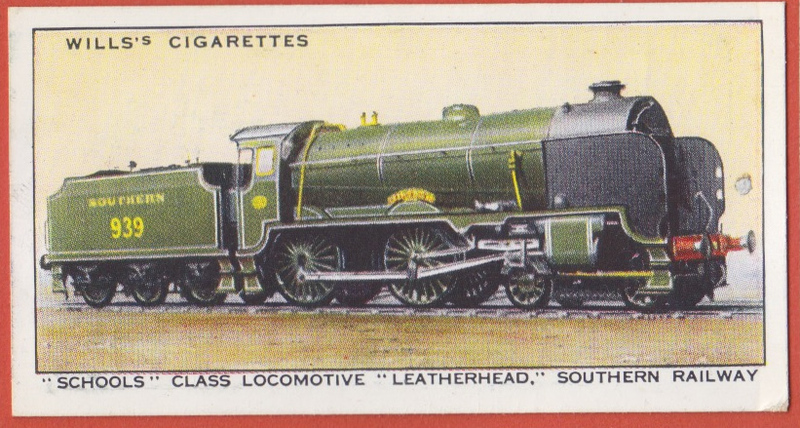 1998’s set was “Britain’s Steam railways”, again 30 cards to collect and another glossy album. The final Castella card set was issued in 1999, a set of ten cards, again with an album, drawn from the eight sets previously produced, and entitled “The Golden Age”. Among the ten, one card was from the 1992 set and two from the 1998 set. GH 13.01: I’m intigued by your statement that there were two AA-20s. My copy of “Elements of Locomotive Development in Russia and the USSR” (how I loved the occasional visit to Motor Books, no longer with us…) has a section clearly named “The Unique 4-14-4”. As they say: Cite? @ OB 0324 – it is worth noting that there are several LR commenters who reside in E17 so you may be appealing to several people in your request for spelling support. 11851 originally had similar bodywork to 11801. It was rebuilt with a more modern cab design (including a seat for the driver!) in 1961. The locomotives had significantly different equipment, for evaluation purposes, which is why their numbers are not consecutive. @Caspar Lucas – the ref to a second loco is in Rakow’s Russische und sowjetische Dampflokomotiven, although it’s far from clear whether the second loco was actually completed/ran. 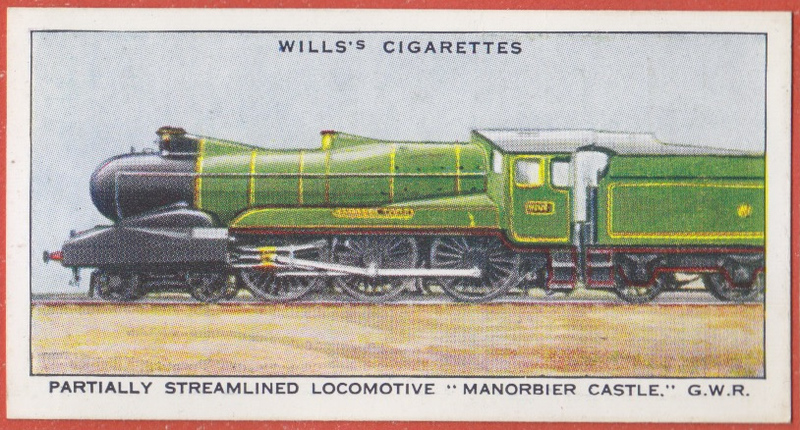 Rakow’s picture is similar to the cigarette card, although the trailing bogie frames look different*, there is much more pipework outside the boiler casing, and the cab details seem different (it also lacks the dedication to Andreev on the smokebox but that could easily have been a later addition) . Given the Stalinist tendency to “adjust” pictures, it’s impossible to say whether this does show a second loco with absolute certainty, hence my use of “seem”. [Should have put a ? after the number AA20-0 – sorry]. @timbeau – apparently the first 3 axles had a conventional coupling rod link, as did the last two axles. The fifth axle seems to have had some form of flexible connexion to the last two. The drive was – as can be seen from the card – to the fourth axle,which was linked to the first 3 and the fifth by some sort of “bridging” coupling rod,with (and Rakow is obscure on this) flexible joints. The whole effect seems to have been more like the Klose system. The maximum play in the front assembly was 145mm and in the rear, 285 mm. There were also some truly astounding proposals for enourmous quadruplex and quintuplex articulated monsters from various manufacturers over the years. @Mark Townend -not to mention the traction for the Breitspurbahn Hitlers; the largest loco was to be a 4-12-12-4 + 10-10 + 10-10 + 4-12-12-4. But then it was to run as a “captive” unit on 3m track. 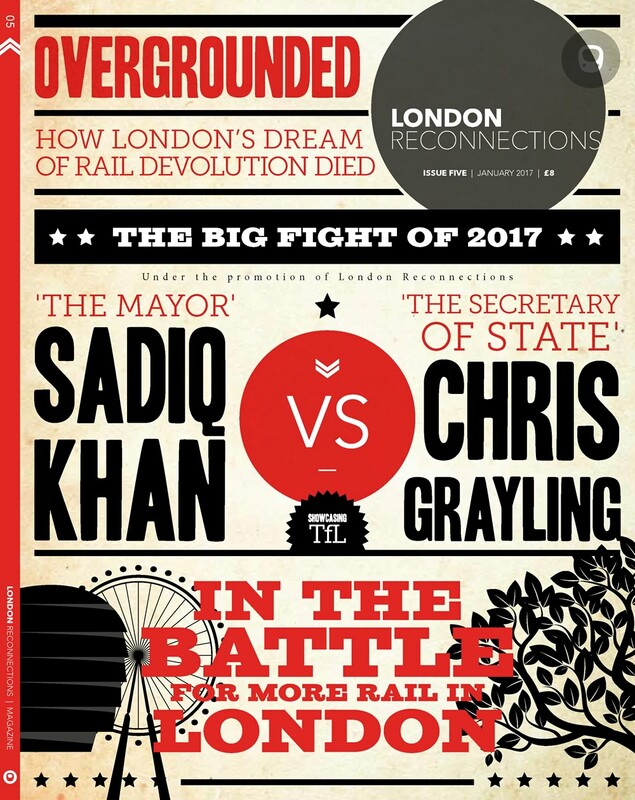 HS2 lacks ambition? @MT – and not surprising that the Soviet loco design team turned next to a Garratt clone. The large steam turbine is a wonderful success,used with great efficiency in coal,nuclear & gas power stations. Yet it has been a miserable failure in railway traction,as the cigarette card reminds us,& it has never been scaled down commercially for very small ships or models. Any one know,or guess,why it is only successful,& hugely successful on a giant scale? Jim, I think there are two points. The first is indicated by your choice of successful applications for steam turbines – electricity generation. The key here is constant speed. The efficiency of a turbine falls off dramatically as the speed moves away from the design speed, I think it makes sense if you think about the mechanics of the steam acting on the blades. The reason why turbines don’t scale down well is similar, but a bit more subtle. Essentially it’s to do with the density of steam and the way you extract energy from it – by getting it to a high velocity and slowing it down as it passes through the blades, this can’t be scaled down much. Perhaps it’s better to think how fortunate it is that boiling water gives us such a good way of converting ‘heat’ to ‘work’ at the industrial scale. Hopefully others can come up with more lucid explanations. Similar considerations applied with early diesel locos, whose marine-origin engine designs often had to be downrated for the tougher railway requirements, with much more frequent changes of speed and load. (There are few gradients on the sea!). Moreover, some of the less successful engines, such as the Mirrlees units originally fitted to the Brush Type 2s, had long and useful second careers afloat. GH 21st May 17.05: “Elements of Locomotive Development in Russia and the USSR” states “The loco named for Andrei Andreev was the only fourteen-coupled steam engine ever built anywhere in the world and like its namesake, who had been made the scapegoat for the 1933-34 crisis in the NKPS*, disappeared from view** in 1935”. *People’s Commissariat of Ways of Communication. **except for anyone with access to the Shcherbinka test circuit until 1960. The ’33-34 crisis does not seem well described except as one of many, exemplified by Stalin’s call in 1930 for the bottleneck of transport “to be resolved in a Bolshevik manner” being followed by the observation “Adequate resources would have been more appropriate”. According to the same source, the Soviet Ya-01 Garrett (“the largest and heaviest steam locomotive ever constructed in Europe”) predated the AA20, was a legitimate purchase from Beyer-Peacock and also remained unique in the USSR, so I take it that your reference is to another revelation by Rakow. I am once again intrigued. On the Ja class point, all I can find is that the loco was assembled at the Proletarski Works – presumably, putting your info together with mine, it sounds as if Beyers supplied a kit. It’s slightly puzzling that either class was pursued at all: the 17th Party Congress had decided on the introduction of the FD class as the standard freight loco. @CL – your points made me look further into Rakow’s bona fides. Alas, his book was published in the DDR (and first in the Soviet Union), but, in accordance with the traditions of those states, there is no biography provided, let alone a bibliography. Clearly, he had access to material that wasn’t available to western authors such as a complete (?) listing of the locos inherited by RZD, but what he could see and what he was allowed to say are unclear. Very interesting to see this thread take a diversion toward eastern Europe. Have we all gone Londoneskt Locomotivesky now? @LBM – 🙂 The eastern European thing is so much more interesting than the back story of, say, the School class, because there is so little information and much of what there is is ambiguous. Add in the Soviet love affair with Modernism and Constructionism, not to mention a tendency to go for the gigantesque, and you have a quite fascinating/entertaining mix. Trying to reconstruct a history of Soviet locomotive policy is a nightmare and probably impossible now. Not a complaint! It’s a fascinating aspect of railway and of Soviet history. Their tendency towards the gigantesque may have reached its apogee with the Caspian Sea Monster, a surface effect flying boat of the 1970’s… but definitely offside on this site. @timbeau – the second Ae 8/14 – 11851 – also had a streamlined body, as I mentioned. Wikipedia comes up with a different fate for Andreyev, suggesting that unlike some of those who crossed him he died peacefully, in 1971, albeit having suffered the ignominy of being relegated to the Soviet equivalent of the House of Lords. Maybe he came back after his 1934 setback, or there was more than one Andrei Andreev? Wikipedia might well be totally wrong of course. In Russia in the 1930s railways were in almost constant crisis, mainly as a result of under-resourcing and political interference. Problems were to be solved in “Bolshevik manner” ie using new and radical ideas, promoted by non-technical commissars and theoreticians. The results were usually unhappy. …reminded me a bit of some vintage Lord Dawlish anecdotes. @Ian J – interesting – Andreyev seems to have been one of the very few senior party members to have survived the entire Stalin era and its successive purges. (Offhand,I can think only of the rather more senior Mikoyan,Kalinin and Kaganovich). Given Stalin’s visceral dislike of “experts” and those who failed to deliver their projects, one wonders what hold Andreyev had over Stalin -an unlikely thought! – especially as Stalin, likeMrs T, was quite capable of pursuing not only those closest to him but also quite lowly people if he thought it useful. The unbelievable collection of up/down/sideways shapes of the heterogeneous rolling-stock behind that Ae 8/14 is amazing. Some “crocodiles” lasted a very long time – I vaguely remember seeing an OBB one at Jenbach, in 1966. L Beria? N Khrushchev? V Molotov? @GT – the luggage van with a clerestory roof is especially nice. BTW there are still a few Crocs around. SBB Historic has a couple that still turn out from time to time, the RhB still has three that run, including the Bernina Croc. Both the latter have been preserved, although only 11801 is in working order. The Ae8/14s were a technological dead end – once multiple operation had been perfected a pair of Re4/4s could do anything one of these could. Actually, it was an Ae 4/6 cab, to be strictly correct. That there was no practical system for multiple operation of steam locomotives without separate crews for each unit was the major reason for the ballooning size of later US locomotives. Multiple unit diesels, each with only very modest power to begin with, proved so much more flexible when they arrived in a big way in the 1950s and that was a big factor in steam’s very rapid decline. There were ways to remotely operate a steam engine as had been applied for short push-pull trains on rural lines in UK and on a much larger scale on various Paris suburban networks where steam soldiered on until the early 1970s. Although these methods allowed drivers to control an engine from a remote cab they couldn’t dispense with the need for a fireman to remain in the steam cab to tend the boiler, and that would also be the case with any notional multiple unit steam lash up of the period for freight haulage. Today, remotely fueling and monitoring of multiple boilers would be highly feasible so if steam ever made a comeback a multiple unit approach, controlled by a single man in a single cab, could make the 1940s style US monsters unnecessary. @MT – and it suggests that the promoters of gigantic complex locos had only a weak grasp of the relationship between crew costs and engineering costs. I’m not very good on Swiss loco types, but all the photos I’ve found of Ae4/6 show a centre door in the cab front. Perhaps you meant Ae6/6? Sorry, yes, a mistype (the Kanton class to be clear). MT 12.28, GH 13.26: Wardale’s “Red Devil…”, to which I referred above, rather more than implies that the 1940s monsters were actually unnecessary, as their poor front-end draughting wasted significant quantities of power (and European practice isn’t judged in any better light). But taking the world as it actually was, GH’s statement seems rather sweeping since under the right circumstances there surely are economies of scale to consider: fewer tenders to manoeuvre into place for coaling and watering, machinery more efficiently located in one place, fewer overhauls in a given time period, overall less space required for stabling and maintenance, etc.? Of course we all know how well (ahem) railway costs were understood in the UK at the time, so I am sure that expensive errors were committed, but there could be a justification for effective gigantism (not necessarily the same as complexity however – examples of American moves towards a form of simplicity being away from compounded Mallets and of course Gresley conjugated valve gear). @CL – what I had in mind was the extra complication of articulation and so on. It’s also worth noting that many”simple” monsters required 2 firemen (or – another complication – automatic stoking.